Derby were robbed. It’s true, there’s no other way of putting it really. But then again, Brighton were by no means lucky in their win over arguably the best team in the division this season. Lewis Dunk and Gordon Greer defended admirably to hold out a rampant Rams side who would have marked Tuesday night’s game as a must win following their defeat to Fulham at the weekend. And even when the aforementioned defenders couldn’t prevent Derby from creating chances, keeper David Stockdale showed form levelling that of when he once made the England squad. A shout for man of the match, along with Stockdale and the centre halves, has to be Chris O’Grady. The big man, who looked all but lost under Hyypia, has turned his form around at the AMEX. Working with scraps all night, O’Grady held the ball up superbly and was key in the creation of Albion’s second goal. Brighton have now won four of their last five home games and appear to have the confidence to look up in to the respectability of mid-table, rather than over their shoulders at the ominous relegation places they seemed attached to earlier in the season. Then again, Derby were the better side and showed this in the first half. Jeff Hendrick came close for the Rams early on when his well hit drive from 20 yards was tipped over by Stockdale. They continued to turn the screw but Albion were resolute and came close through Sam Baldock when his half-volley was well saved on the angle. And, against the run of play, Brighton carved yet another good chance as Inigo Calderon found the ball at his feet following a low cross, his shot was wide and wayward. Shortly after, Derby came extremely close to opening the scoring. Richard Keogh’s goal bound header was turned over brilliantly by Stockdale and the half ended goalless. Derby’s dominance became increasingly apparent following the interval. Jamie Ward’s low, curving ball was inches to deep for Russell to finish. Ward, one of Derby’s best performers, came close with a shot from range and minutes later another Hendrick drive was saved by Stockdale. 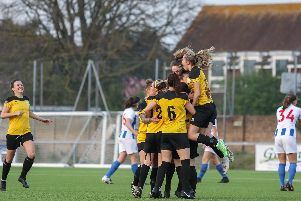 But, to the surprise of all Brighton took the lead as substitute Stephens was on hand to dispatch the ball in to the corner following a scramble in the box. And even more surprisingly, another substitute, Lua Lua finished well with his left foot following Chris O’Grady’s through ball to secure a terrific win for the Seagulls.